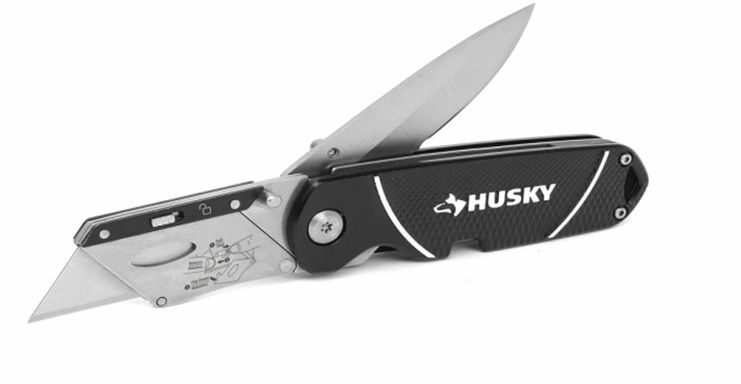 The Husky Twin Blade Folding Utility Knife features 2 knives in 1 compact design a folding lock-back utility knife and a folding lock-back serrated sporting knife. The folding lock-back utility knife features a quick-change blade mechanism that accepts standard size utility blades. The lock-back design locks either blade in place for safe and efficient cutting while the convenient folding design and lightweight aluminum handle make it easy for a user to safely store the knife in their pocket. This DEWALT Folding Pocket knife is designed for Heavy-Duty use. The Stainless-steel blade is for durability and rust resistance. The knife has a tanto tip that helps with piercing through tough materials. The Liner lock secures blade in open position. The Milwaukee Fastback Hawk Bill Folding Knife features Press and Flip, a one handed blade opening for easy activation and activates the blade up to 3X faster than a 2-handed opening. A thin all metal body stands up to jobsite abuse. The reverse wire form belt clip makes it easy for a user to store the knife without tearing up the pocket. The Curved Hawk Blade engages material for easy pull cuts. Twin Blade Folding Utility Knife The Husky Twin Blade Folding Utility Knife features 2 knives in 1 compact design a folding lock-back utility knife and a folding lock-back serrated sporting knife. The folding lock-back utility knife features a quick-change blade mechanism that accepts standard size utility blades. The lock-back design locks either blade in place for safe and efficient cutting while the convenient folding design and lightweight aluminum handle make it easy for a user to safely store the knife in their pocket. Twin Blade Folding Utility Knife is rated 4.0 out of 5 by 1.